When we were growing up, we were taught about economy on the kitchen. Using leftovers was a part of that teaching. But we also learned that leftovers needn’t be greeted with a groan. Leftovers don’t have to be carbon copies of the previous night. They can be tasty and unique dishes unto themselves. Shepherd’s Pie is one dish that fits the bill. It is a dish that was common to our father Lawrence as well as Aunt Margie and Aunt Vie. Leftovers were actually planned for ahead of time. Extra mashed potatoes and gravy were prepared. The roast would be extra large so that more meals could be made from it. There was breakfast hash, oriental style fried rice, roast beef sandwiches and shepherd’s pie all clamoring for leftover roast beef. In the following recipe, there is a formal list of ingredients but for economy, what’s in the fridge is the real key to what goes in the pie. Why not add that small bit of leftover green beans? Shepherd’s pie is a traditional English dish made with lamb and therefore called Shepherd’s pie. The same dish made with beef instead, like this one, is called a cottage pie. 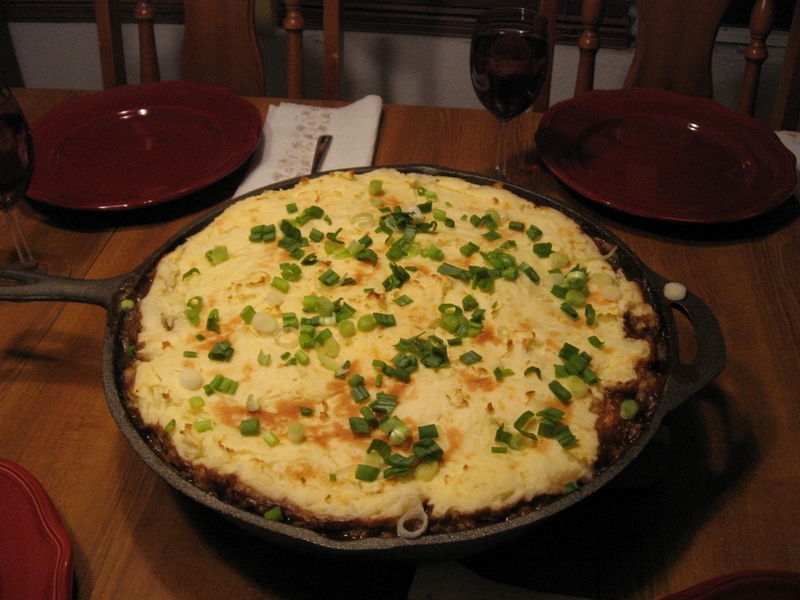 The most rudimentary cottage pie is a layer of ground beef, then corn and topped with mashed potatoes. Add egg to mashed potatoes and mix thoroughly. Set aside. In just enough slightly salted water to cover, simmer carrots until tender. Add peas, remove from heat and set aside. In a large cast iron frying pan, sauté onions in butter until onions just start to brown. Drain peas and carrots well and add to onion mixture. Add beef and gravy, stir, mix and cook until heated through. Remove from heat. Spoon potatoes over meat mixture and cover completely. Bake in a preheated 400?F oven for 30 minutes or until potato topping is nicely browned. Sprinkle with shredded cheese and return to oven for a minute or two to melt the cheese. Sprinkle with a bit of paprika and garnish with sliced green onions (white and green parts together).